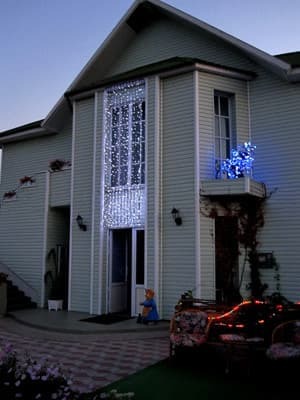 Holiday Village "Green House" is a two-story mansion, which is located in the central district of the village. Kirillovka on the shore of the Azov Sea. 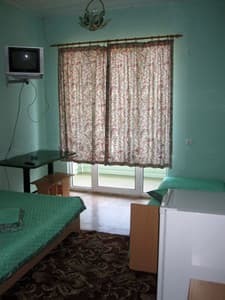 To the attention of guests - rooms of economy class and luxury. In the economy category: modern beds, table, chairs, refrigerator, TV, shower and toilet are on the floor. The suites are decorated in a designer style in various colors, equipped with modern furniture, air conditioning, TV, refrigerator. Each room has an exit to the terrace with a small table, in the room there is a bathroom with a shower, a toilet, a washbasin. 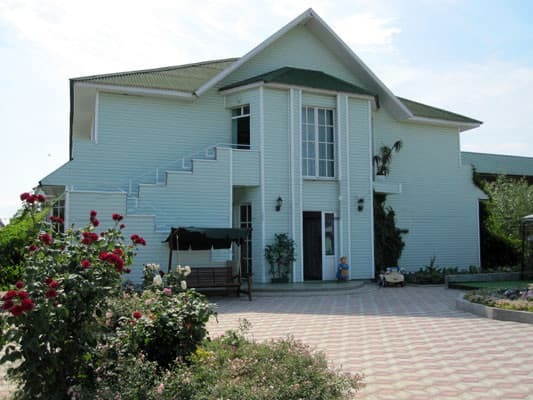 On the territory of the recreation center "Green House" there is a parking for cars, a children's playground, also there is an Internet Wi-Fi. It is possible to eat deliciously in a cafe. Near the recreation base "Green House" is a large market, attractions, fun discos, shops and a bus station. The distance from Melitopol to Kirillovka is 65 km. Description of the room: In the room - modern beds, table, chairs. Exit to a small terrace. 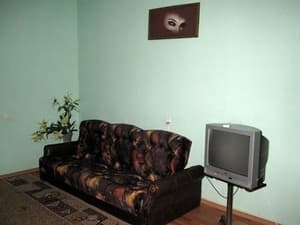 Description of the room: The rooms are decorated in a designer style in different colors, equipped with modern furniture. Each room has access to the attic with a small table. Bathroom - shower, toilet, wash basin, cold and hot water around the clock (a boiler for two rooms). Description of the room: The rooms are decorated in a designer style in different colors, equipped with modern furniture. Each room has an exit to the terrace with a small table. Bathroom - shower, toilet, wash basin, cold and hot water around the clock (a boiler for two rooms). Отличное месторасположение-рядом рынок, до пляжа 10 минут через ближайшие базы отдыха, очень красивый двор, много зелени и цветов, чистый номер с современным ремонтом и техникой. Добродушные хозяйки, что очень располагает и даже можно советовать друзьям и знакомым данный коттедж для проживания! Не всегда удобно было парковать машину. Чистая и очень ухоженная территория вокруг дома. Есть возможность заказывать приготовление еды у хозяев. Тихое место, очень вкусно готовят, быстро реагируют на просьбы. There is a possibility to eat in the cafe of the recreation center on the menu or for an extra charge order dishes of home cooking. 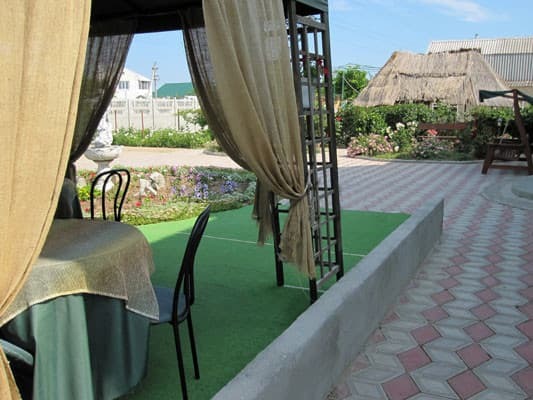 The recreation center "Green House" is located in the center of the town of Kirillovka, near the bus station. 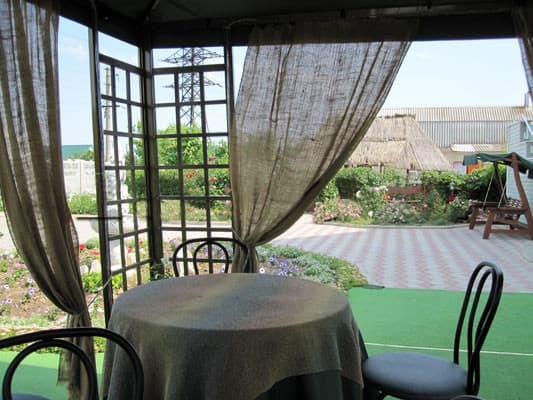 By rail or road transport to the city of Melitopol, then by regular bus or shuttle bus to town. Kirillovka.